The POWER ACCESS® Model 2300 is an automatic door opener designed for opening and closing side hinged residential doors - both exterior and interior. Complete kit to assist disabled individuals toward independence, the 2300 residential door opener makes access by opening the door, and egress by closing the door easier. It is simple and unique in design and is not intended for heavier duty commercial situations. The unit consists of a 115 volt gear motor, friction clutch and electronics that is feature packed including a radio receiver as well as a transformer capable of providing "one shot" 24vdc power to release an electric strike (lock). Additional Wall Switches, Remote Controls & Keyless Entry Options available, see below. The POWER ACCESS® Model 2300 can be retrofitted to most residential side hinged doors for power opening and power closing - or the door can be opened and closed manually. The model 2300 unit can be door mounted on the pull side of the door (right or left) with the arm attached to the top of the doorframe. This door mount application will meet most of the front door situations where the door opens in and the door opener is protected from the outside weather. The minimum back clearance requirement from the face of the back of the door is 3 inches. The arm assembly consists of a friction clutch arm that is attached to the motor shaft and the other end to an adjustable threaded regular forearm that in turn connects to the doorframe by means of an adjustable shoe. The POWER ACCESS® Model 2300 can also be jamb mounted to the top of the wall above the door frame on the push side of the opening (not on the pull side) with the motor shaft facing down and the shoe of the adjustable forearm extension attached to the door by means of the shoe. The arm for the jamb mount application requires an extended forearm, which has a longer threaded portion with lock nut to meet deeper reveals (up to 7"). If a unit is ordered for jamb mount it will come with the longer forearm extension. The hand is always determined by standing on the "push" side of the door and observing on which side of the door the hinges are located - a door with hinges on the right requires the right hand configuration - door with hinges on the left requires the left hand configuration. Door mount models are also handed from the push side of the door even though the unit is installed on the pull side. *The jamb mount model cannot be mounted to the side jamb or on the pull side of the door. 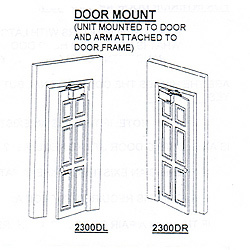 Also it is not recommended that the 2300 jamb mount unit be used on an out swinging exterior door because the external forces might cause the door to drift closed when not under power. Physical application: Jamb mount or door mount. Dimensions: 12-3/4" x 6" x 3-1/2"